Tour dates: 17 March - 17 May 2009. Air travel is shown in blue; bus and train travel is shown in pink. The starting point was Hong Kong. Took another local bus to Longshen. Quite crowded. The first nine kilometers went through Guilin's urban sprawl, no less ugly than downtown Guilin, just highrise concrete boxes that hide the peaks behind them. Modern Chinese architects have less sense for beauty than Stalin's architects. The scenery improved after Guilin, first rolling hills and soon the road wound its way up to 630m, then back down to 250. There was a burnt smell, and the driver stopped and cooled his brakes with a water hose; steam rose. At one point the driver looked at me, asked "Ping'an? ", and when I nodded, he stoped and I got off and caught a bus stopped on the other side of the road. 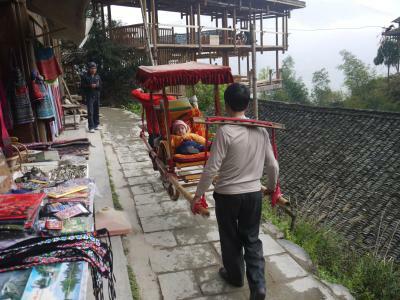 After numerous switchbacks, the new bus reached the small hill village of Ping'an at an altitude of 825m. The only part of the village reachable by motor vehicles is the parking lot at the town's entrance gate. It's a marvellous view - many old ornamented wooden houses cling to the side of the mountain on stilts, with every bit of space used. I was staying at the Countryside Inn, all wood, slightly creaky and unheated (it's fairly cold up here) but very nicely renovated with friendly English-speaking staff. People come here not only for the village, but for the rice terraces. They cling to the side of the mountains, follow their contours, just like the village itself. They are huge - dozens and dozens of terraces, usually no wider than one meter, and some as narrow as 30cm, separated by artificial walls and an ingenious irrigation system. They terrace hillsides as steep as 70 degrees! 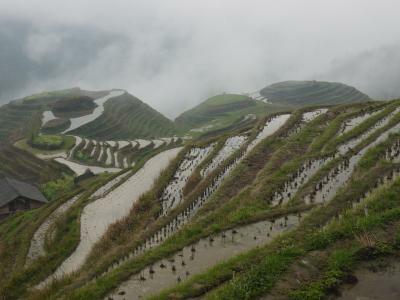 There are several paths that climb up to over 1000m and allow fantastic views over the endless terraces. Wisps of fog add atmosphere. In the evening, the fog creeps up from the valley until it's difficult to see. More walking among rice terraces. They have pretty much carved up most of the mountains around Ping'an. Like the fields, the path follows the contours of the mountain, and is mostly paved with slippery stones. Fog rolls over the hills all the time, sometimes I can't see anything and sometimes a vista opens up, and changes again a few minutes later. At strategic points, local women in colorful dresses and hairdresses, carrying baskets of souvenirs, waylay tourists. But like elsewhere in China so far, they are friendly and never tenacious. 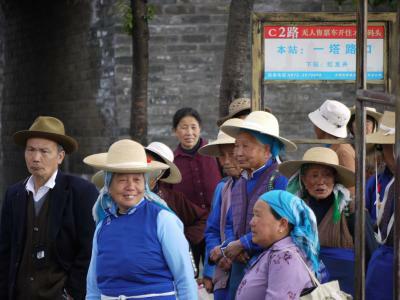 At one of the main viewpoints, dressed-up local women (below) pose for tourists. 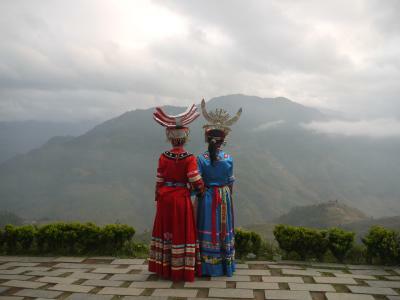 Their elaborate headdresses seem made to impress tourists, but it seems that local minority people do maintain their customs and traditions. 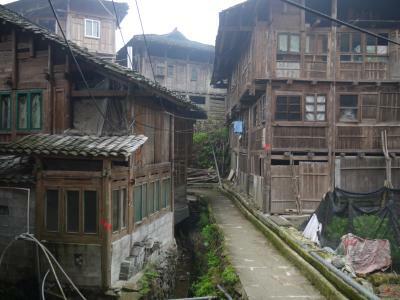 There are no streets in Ping'an, just narrow winding paths between the wooden houses. Most of the time, the paths are stairs. There is much new construction, but fortunately using wood and traditional designs, using concrete only for foundations. In the morning, the fog was so dense that I couldn't see more than ten meters. I took the bus to Longshen, then another to Sanjiang. Both towns are modern and unremarkable. 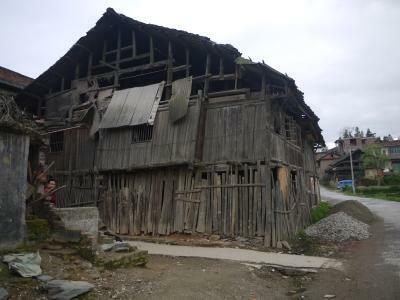 The road is scenic, winding along a river valley, but many of the occasional small rice terraces look neglected and overgrown, and the villages are dilapidated, with leaning wooden buildings and rusty satellite dishes. 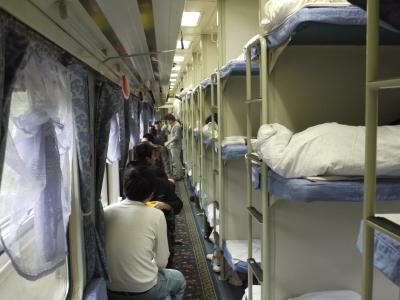 Trouble is, the train leaves seven hours later and arrives in Huaihua (pronounced why-wah) at midnight. So I while away the time walking to two nearby villages, where people look at me with astonishment, watch people in the station, and with train-spotting. Relaxing, but it's cold. People in the waiting hall smoked, spat on the floor, and dropped peanut shells and orange peels on the floor. They do this in buses and trains too. The Huaihua Great Hotel (that's its name) is modern and very comfortable. Of course, nobody spoke English, except a young page who has picked up a few words. In the room, the minibar included underwear, two kinds of condoms, lubricants, and aphrodisiacs. Figures, I was wondering about the tenacity of the hookers outside, although the hotel itself is a straight business hotel. Didn't see a Westerner all day. Actually I wasn't interested in Huaihua, it was just too late to continue. My destination was Fenghuang, and the next morning I took a bus there. It's only 40km as the crane flies, but takes two and a half hours because the road is almost never straight and goes through one gut-wrenching curve or switchback to the next. I had been unable to reserve a hotel because the two numbers given by the Lonely Planet did not reach someone who spoke any English. So I just walked around in Fenghuang until I found a hotel I liked, and checked in. Of course, no English spoken at the reception, but they have an Internet PC, and they asked me to come behind the counter, called up the Yahoo translator, and we discussed rooms by typing questions and answers and trying to make sense of Yahoo's translations. Cool. They also have a talking calculator that chirped a cheery comment in Chinese on every key press. The Flowers Procumbens Hotel - who comes up with these names? - is modern, very uncharacteristically stylish for China, and generally pleasant. They tried to switch rooms on me, giving me a key to a room other than the one I was shown, but I got it switched back. The hotel has an associated Internet Cafe that has - a miracle! - well-maintained Windows PCs that don't put a virus on my flash card like all other hotel PCs in China. 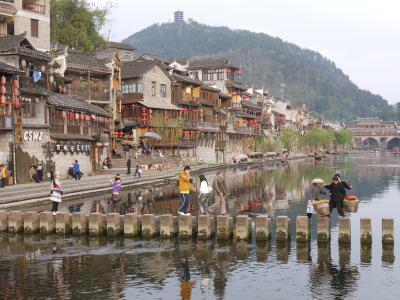 Fenghuang is a beautiful old town on both sides of a river. The waterfront with its old but renovated wooden houses is exceedingly scenic in the evening sun. I really loved the place and decided to stay here for a few days. There were tourists but not many, although I bet that it's completely packed during holiday seasons. They are all Chinese, again no Westeners in evidence today. I was standing out so much that Chinese tourists ask me if they can take pictures of me. It took a while to find a restaurant because of the language barrier. In the first I asked for a chicken dish by pointing at a huge chicken in a coop outside, and all seemed fine, until the cook grabbed the chicken and carried it to the kitchen and was about to kill it before I could stop the impending massacre... The strategy works at another place, and I get my chicken. Preparation is easy: they simply chop it into rectangular pieces, bones at all, and fry it in a wok; I wolfed it down with chopsticks except the head and the feet, couldn't find any meat on those. More wandering in Fenghuang the next day. Down at the steps along the riverfront, women sit side by side, washing clothes and washing vegetables in the murky blue-green water. There were even fewer tourists here than the day before, although I actually met two Germans. Restaurants have headless unplucked pheasants, and drying fish and flattened pig faces (really!) 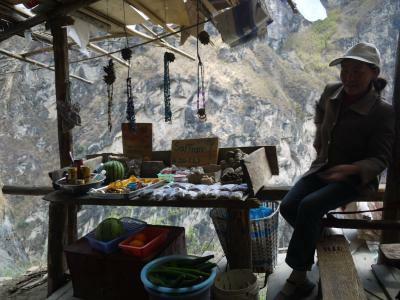 hanging out front, and countless little shops sell dried fruit, cigarettes, firecrackers, and lots of crossbows. I don't know what these people have about crossbows. Also went to the new part of town. Less scenic, and there is car traffic that is almost absent in the old downtown, but they do make sure that the architecture doesn't descend into bland modernism like in other towns. They have a covered market too that is noticeably cleaner and less smelly than other such places elsewhere; people have lunch there on long tables. Bought excellent Dim Sum in a plastic bag from a street vendor. Outside there was a T-shirt shop where Osama Bin Laden and Harry Potter peacefully hung side by side. 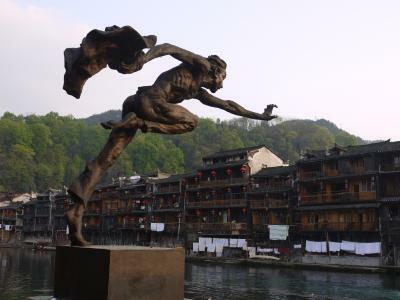 Also did the museum circuit of Fenghuang. They sell a combination ticket that is good for all museums and sights in the old town. A number of pretty temples and homes of important people, and a collection of fossils, but no must-sees. I was planning a day excursion to Denang, a small peaceful village two hours north. But I was the only passenger at the bus stop, and they kept cancelling buses. The weather had always been overcast in the morning with a hazy sun in the afternoons, but that day was cold and miserable. Further away from Fenghuang's old downtown, the enthusiasm for the old building style evaporates, and Fenghuang becomes one more of these drab Chinese cities that have successfully obliterated their history and culture. So I went back downtown. Mothers here have tall baskets slung around their backs in which they carry a baby, stuffed with pillows so that only a happy face sticks out like a cherry on a cake. Minority women with tall turbans (some three times the size of the one in the picture) sell souvenirs; it seems that the designation "minority" is more a profession than a heritage. In the evening, they sell paper flowers with a candle in the middle that people float down the river. All in all, a lazy day. The next day started with a cold drizzle. 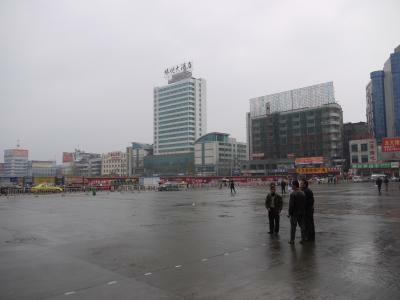 I took the bus to Huaihua and walked about town for two hours. 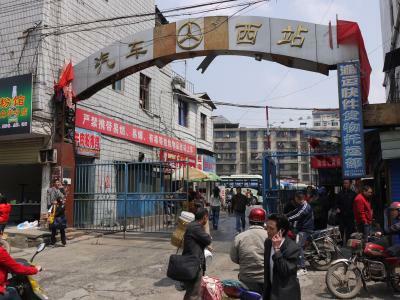 It's typically Chinese, both modern and run down, with heavy traffic and no soul. They had cleared a huge area south of the train station for new construction. I got on the train to Kunming 30 minutes late. I had a bottom berth (the best one, I can look out the window and stow my bag). Some guy wanted to trade but I pretended not to understand - the language barrier works both ways... Later he started smoking, spat on the floor, and dropped sunflower seeds on the grubby carpet. Then he gave me an orange and some seeds and a minty-tasting dried fruit to chew, and he was my friend. I am easily bribed. The bunk beds in "hard sleeper" were comfortable and - surprise - long enough for me. The train arrived in Kunming at 7:00. Kunming another boring modern city, although fresher than Huaihua; I took one look at it and decided to move on. Twenty minutes later I was in an express bus to Dali. As apparently happens frequently, the bus didn't follow the schedule and terminated in Xiaguan, where hordes of drivers wanted to drag us into their cabs and tuk-tuks for the remaining distance. I opted for a local bus, together with a British/Australian couple I met on the way. In Dali, we checked into the Tibetan Lodge, which has cute but tiny single rooms. And it's sunny with a deep blue sky! 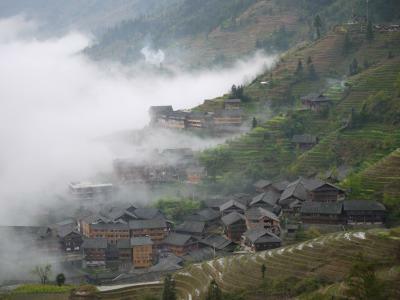 Goodbye hazy Hunan, welcome Yunnan! 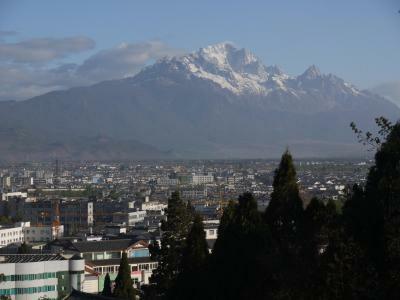 Dali is a walled square of mostly pedestrianized streets lined with old wooden houses, against a backdrop of a mountain range that is so high that there is still a little snow on top. Quite beautiful. 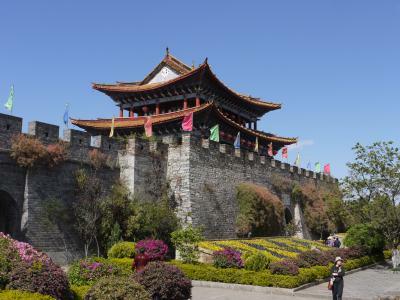 There are lots of shops selling souvenirs, jewellery, clothes, and tours; also lots of restaurants and a few pagodas and guard towers along the city wall (the picture shows one) sprinkled in. 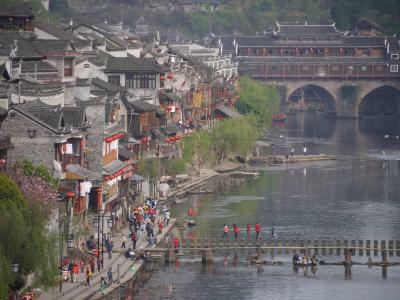 Like in Fenghuang, there are no American chains like KFC, McD, or 7Eleven. English is understood here, a little. It's very pleasant to stroll about town. It's still off-season so there are few tourists here, this time including a few Westeners. The town looked as if it could become a zoo during peak times, but I loved it. I had dinner at the Tibetan Cafe. They have hors d'heaves, fried glory with garlic, and gees (eggs). Not bad but a little uninspired apart from the diction. 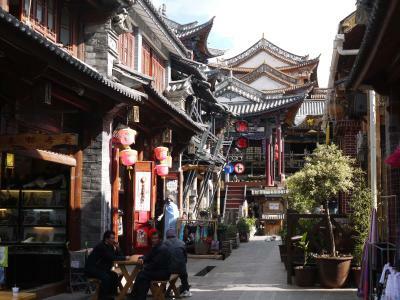 I liked this town and decided to stay another day before taking off for its more famous cousin, Lijiang. A short bus ride brought me to Caicun, a village at the large Erhai Lake close to Dali. 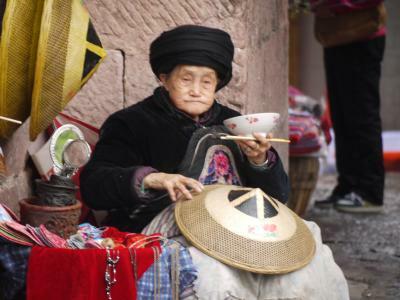 From the bus stop, I joined a trek of over a hundred old women with large straw hats, wicker baskets, and the occasional plastic bowl with fish, through the narrow streets of Caicun, along the lake, to a market square at a pier on the lakeshore. It's packed with vendors with carts, tables, or just bowls on the ground, selling vegetables, fruit, meat, and fish. Chickens are slaughtered, plucked in plastic buckets, and sold on the spot. 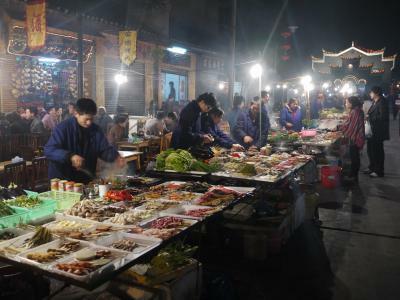 There is a small temple where people bring bowls of offerings, like fruit and fish, and return with incense that is burned on a pyre in the middle of the square. It's quite crowded everywhere. Even Chinese tourists are aliens here; I saw only two. They have tour boats on the lake, but they take all day, so I went back to Dali and rented a bicycle to visit several other nearby villages, and to keep kirikou happy. Some of those villages, and the paths through the fields, don't seem to get any tourists so children stared and smiled at me and called out "hello" all the time. I also took a chairlift up the mountains behind Dali. It takes 20 minutes to gain some 600 meters, gliding between and above the treetops. People going the other way called out to me and take pictures, I guess they don't see many Europeans here... Loudspeakers mounted on the chairlift towers played official-sounding Chinese announcements. There is a temple complex at the top, and many hiking paths. The views are great, but some clouds have come in and the valley and the lake are a patchwork of sunlight and shadow. When I return to the chairlift station at 18:05, they had just shut it down. Walking is impossible, there is only a very steep dirt path and it's only an hour till sundown. So the officials conferred and restarted the chairlift just for me! 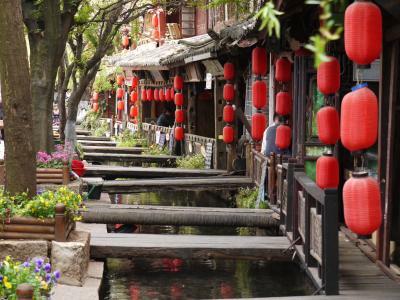 Which town is nicer, Dali or Lijiang? 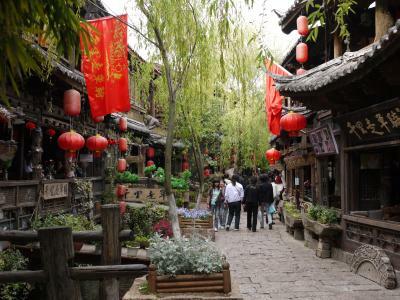 My vote goes to Lijiang. Dali has wider boulevards, beautiful gate pagodas, and the lake. Lijiang is a maze of narrow alleys lined with old and low buildings, many small canals with little bridges all over the place, often lined with ancient dark wooden houses with little plank bridges leading to their doors like in the picture. There are many tourists, but they lose themselves in the many side streets, and the souvenir shops aren't quite so obtrusive. A hill cleanly divides the historic old town, which is completely unmarred by modern construction, and the modern town. Where the hill ends, both parts are joined by a pair of water wheels, and a guard house where tourists must pay for admission to the old town. On top of the hill is the Looking At The Past Pagoda, a tall wooden construction with a little park and forest. The view of the town and the mountains in the background from the top floor is fantastic. It was a little cloudy when I was at the top, but when I was back down at the bottom the sun came out so I ran all the way up again to shoot panoramas. 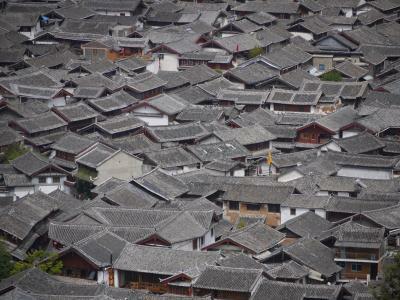 The picture of the dense tangle of roofs of the old town below, and the new town with the mountain background were shot there. 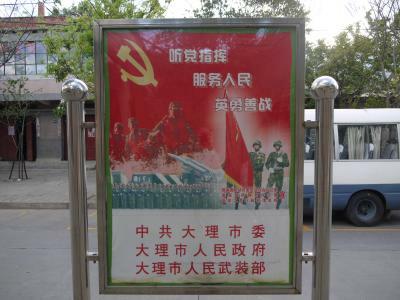 There are inspirational signs all over Lijiang. One reads "Civilized behavior of tourists is another bright scenery rational shopping". Sure, whatever. 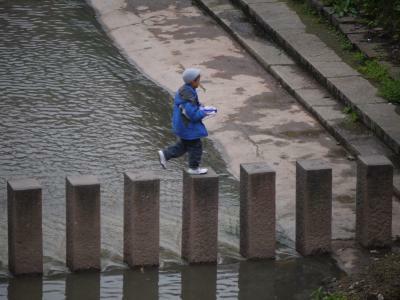 Saw a little boy refill his KFC cup from a canal - the old town has no chain stores but the new town does. Had lots of rain at night, and a short shower in the morning too. 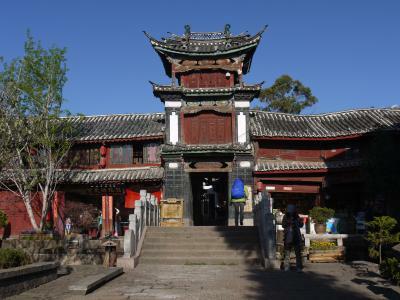 There is a hill that cleanly divides the old and new town of Lijiang, with the very tall Looking At The Past Pavilion pagoda on top. The panorama from its top over both towns and the mountains in the background is fantastic. I took a panorama series of pictures with cloudy skys, and went back down to see the nice wooded park around it. Then the sun came out and I had to run up again and do it all over. Walked around in Lijiang for a few hours. There are quite a few tourists here (it's a Sunday), but they are all in a few prominent streets, and just ten meters away I pretty much had the place to myself. It's easy to get lost in this maze, and there are beautiful views everywhere. Went back to the guesthouse and had Mama Naxi book a flight to Xi'an for Tuesday. When the ticket arrived, my name was misspelled, and Mama Naxi sorted that out with furious bursts of Chinese. 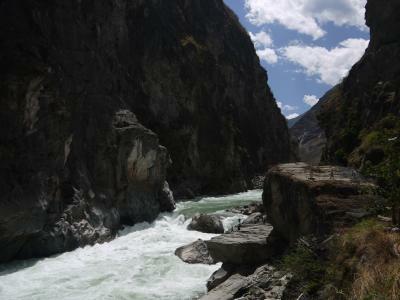 I also booked a bus to the Tiger Leaping Gorge for a day trip. It's normally a two or three day hike, but the weather report said thunderstorms and the trail on the edge of the cliff is steep and slippery in places. Dinner was great again. It seems that whenever someone mentions an exotic and out-of-the-way place in Asia, half the people at the table has been there, and give recommendations on hotels, train schedules, and sights, and report funny stories. 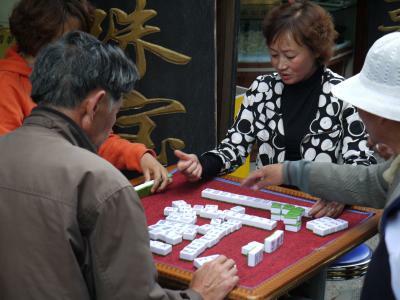 Mama Naxi's is the information nexus of Lijiang. 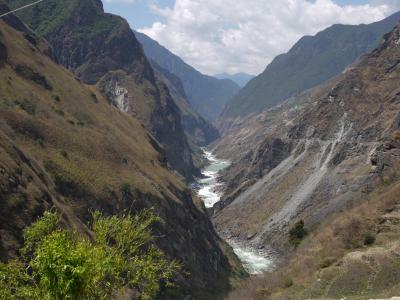 Tiger Leaping Gorge is a very deep and long canyon two hours north of Lijiang. Most people there do a two- to four-day trek over the ridge high above the river, but I made it a day trip to the most scenic spot, down the side to the river. 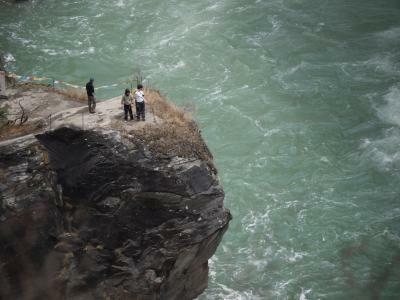 As I write this, I am sitting on the Daydreaming Rock down at the foaming Yangzi river at the bottom of the gorge. In the middle of the rapid is the Tiger Leaping Stone that gave the gorge its name; legend says that a tiger used it to cross the river. Why it would do that I don't know, there is a vertical rock wall on the other side; the highest mountains on the sides rise to 3900 meters with 80-degree rock walls! That's more than twice the depth of the Grand Canyon in Arizona. Yet the sun reaches the bottom at 13:00. It's a 340m climb down a rocky path from Tina's Guesthouse, a popular stop at this point. We got a few people together and hired a guide. The views are fantastic. The climb back up, using another route, was far steeper; an almost uninterrupted series of narrow steps, hugging the edge of an almost vertical rock wall. Ropes are strung on the wall side to hold on to. There is a very long ladder at one point where no path could be built, and another shorter one later, that lead straight up the cliff face. The ladders are made from steel rebar, welded and strung together with wires (so they shake a little) and have steps only every 50cm or so. Quite tiring. It's less dangerous than it sounds because it was dry. It seems that the Chinese modernization rampage, here building another Yangzi dam that would flood the gorge, is temporarily on hold. Still, I am very glad that I had the chance to see it before it might get destroyed. 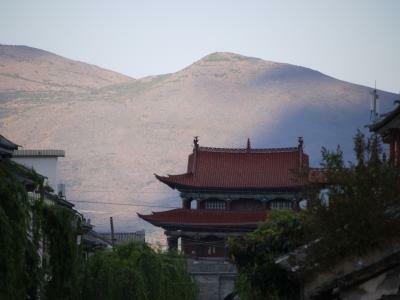 Lijiang wakes up at 9:00, and is very peaceful before that. Shops are shuttered, and people squat at the little canals to brush their teeth. Pink rose bushes are everywhere. Tried a "Naxi Pizza" for breakfast, but it was an inedible thick pancake soaked in grease. When I checked out, Mama Naxi gave me a little bag with bananas and yoghurt, and hung a little charm around my neck. 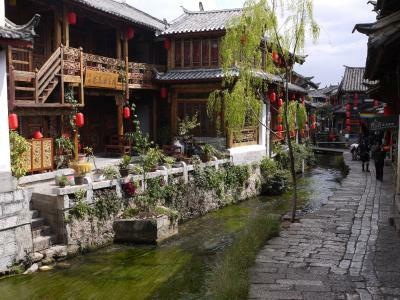 If you ever make it to Lijiang, you know where to find the only accomodation option that makes sense. Call 0888-5100700, Mama speaks English. 50 Yuan for a dorm bed, 150 Yuan for the best room in a quieter house around the corner with its own covered patio (mine). She doesn't seem to have a homepage, google her and you'll find that everyone loves Mama Naxi. The China Eastern Air plane departure time at 12:00 to Xi'an came and went. First it was "delayed", a Chinese word that means "in a few hours, maybe, or cancelled", then it had a very minor technical fault and an engineer would be flown in, then it was officially cancelled. They put us on another plane to Kunming where we'd transfer at 22:00. In the meantime they put us in a quite decent hotel to rest and for dinner; the staff was always quite helpful. Back at the airport, 22:00 passed, no plane, it's "delayed", a Chinese word that means "you are dead". Sometime after midnight they found a plane for us; we boarded and sat around the runway for a long time because there was a "delay", a Chinese word that means "gotcha". Some passengers actually got into a shouting match with airline personnel (unfairly I think). Chinese is very well suited for cursing. I arrived at the hotel in Xi'an at 4:30 in the morning, eleven hours late.